Mini Me Geology Blog » Trouble Growing Large Salt or Sugar Crystals? Use the stove! Trouble Growing Large Salt or Sugar Crystals? Use the stove! At rock camp, we perform the salt crystal growing experiment. I use a portable coffee maker to heat the water. We use equal parts salt and water and grow several small salt crystals on the string that dangles into a mason jar. Success! However, if you really want to grow BIG crystals, use a stove top to make your solution. You can do this to begin with or after you have a few small crystals on the string. Here’s how. Growing salt and sugar crystals from a solution is a great experiment to teach kids how igneous rocks form from molten rock. The size of the crystals that you grow on your string is limited by the amount of salt and sugar that you can dissolve into your solution. Using the stove top to heat your water often allows you to dissolve a little more salt or sugar to grow a little more and a little bigger crystals. To create a solution on the stove, pour enough water to fill the mason jar into a small pot. As the water heats, pour salt or sugar into the saucepan and stir until it is fully dissolved. Keep adding more salt or sugar until the solution is saturated and no more will dissolve. Pour the solution into the mason jar and replace your string and secure it to the top of the jar. If you are using this method from the beginning of the experiment, fray the string slightly before placing it into the soltuion to give the crystals something to grow on. If you are replacing the solution, the crystals will grow on top of the seed crystals already on the string. 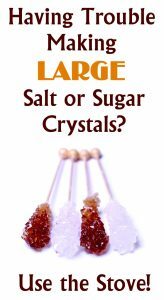 How Big Can Your Salt or Sugar Crystals Get? That depends on your patience. You can replace the solution as many times as you want to grow bigger and bigger crystals. For a fun twist, add a touch of food coloring to your solution to created colored crystals. Let us know how how this method works for you. We’d love to see pictures of your crystals.